Government officials at the National Transportation Safety Board (NTSB) held a public forum in Washington D.C. to discuss methods of improving pedestrian safety, as state and federal data shows pedestrian injuries and deaths have continued to increase in recent years. The forum, held on May 10 2016, featured four panels, each of which looked at different facets of pedestrian safety. An estimated 5,000 pedestrians are killed each year in accidents with automobiles, and thousands more are severely injured, according to the National Highway Traffic Safety Administration. Research suggests that driver negligence contributes to a whopping 94 percent of all motor vehicle accidents, and pedestrians are the most vulnerable to catastrophic harm in the event of a knock-down. Data from NHTSA shows that nearly 75 percent of all fatal pedestrian knock downs occur in urban areas, with the majority occurring at night and near an intersection. Alcohol impairment also plays a significant role in these deaths, as nearly half of pedestrian fatalities in 2011 involved either the victim or the driver with a blood alcohol concentration of .08 or higher. 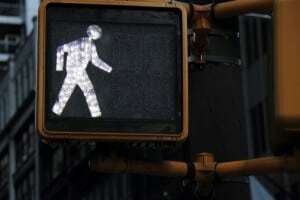 Recent statistics regarding pedestrian accidents are not encouraging. The first half of 2015 saw 2,463 pedestrian deaths: a 10 percent spike from the same time frame the previous year. Those who travel by foot, wheelchair, skateboard or scooter are among the most vulnerable users of our nation’s roads and sidewalks. The CDC reports that pedestrians over the age of 65 accounted for 19 percent of all pedestrian deaths in 2013, and that teenagers are more likely to need emergency room medical care for crash-related injuries when compared to other age groups. Reckless driving, poor road conditions and inclement weather can all lead to accidents that harm pedestrians. Unfortunately, pedestrians are often at the mercy of motorists and their vehicles. Whether it’s a child walking home from school, or an elderly person attempting to cross a busy intersection, drivers need to be on the alert for pedestrians and use extra caution when driving near schools or crosswalks. As is quite often the case in pedestrian auto accidents, catastrophic injuries can prove life-altering. Victims who suffer such debilitating harm may end up with permanent disabilities and unable to work, let alone pay hospital bills. Medical expenses for treating a traumatic brain injury, broken bones, and spinal cord injury can put victims and their families on the edge of financial ruin. A qualified personal injury lawyer can be allies for pedestrians harmed in crosswalks, parking lots, and other areas where knock downs are common. If you have been involved in a pedestrian auto accident in Maine, the attorneys at Hardy, Wolf & Downing are prepared to evaluate your claim, start an investigation, assess your damages and pursue litigation on your behalf. Because our legal team works on a contingency basis, there are no upfront costs, and the initial consultation is always free. Call 1-800-INJURED today to arrange a case review.